Last week’s episode of THE WALKING DEAD had no shortage of thrill and shock and tonight’s episode called “When the Dead Come Knocking” it does not look like it will be any less so! On tonight’s show Michonne ends up at the prison with some walkers and I was shocked at first to see that they didn’t try to kill her right away, but don’t worry, next week they come after her behind the prison gate and she does some creative slicing and dicing until Rick takes her in. Michonne then goes on to tell Rick and the group all about the Governor and his dirty little town of Woodbury, she also tells them about Maggie and Glen’s abduction. I got a feeling the Governor is going to have a run for his money with Michonne and Rick teamed up together. Meanwhile, Glenn and Maggie are taken to Woodbury and Merle gives the Governor his twisted version of what happened that brought the two there. Merle claims to have killed Michonne – when he inevitably reunites with his brother and everyone finds out that Michonne is with the group, he is going to have a lot of explaining to do. 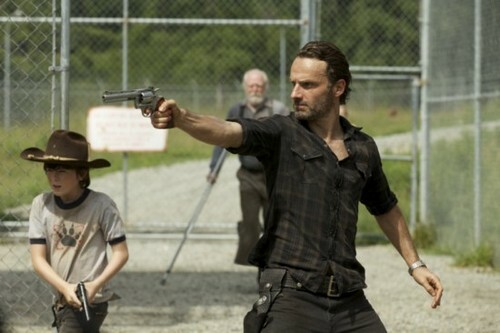 Tonight’s The Walking Dead Season 3 episode 7 is going to be exciting, and you won’t want to miss it. So be sure to tune in for our live coverage of the new episode of The Walking Dead — tonight at 9PM EST! THE WALKING DEAD SEASON 3 EPISODE 7 LIVE RECAP HERE!